Carpenter Square 16" x 24"
Komelon Stainless Steel Tape Measure, 25ft has all metallic components that are stainless steel for improved rust resistance and a nylon coated blade for maximum durability. 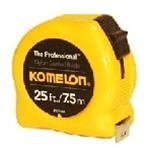 Komelon Tape Measure, 25ft has a nylon coated blade that resists abrasion and blade wear. Komelon Stainless Steel Tape Measure, 16ft has all metallic components that are stainless steel for improved rust resistance and a nylon coated blade for maximum durability. Sale price good through 4/30. Contractor grade combination square with a square for English measurements, a level vial, and a scratch awl. Stanley Tape Measure, 16ft is the contractors choice for a quality measuring tape. Stanley Tape Measure, 25ft is the contractors choice for a quality measuring tape. Template Wood (20 pcs per bundle).